Forgive me, it's been a long running thing of mine that the European Union should be destroyed. And I looked back to the Latin of Cato to provide me with my rhetorical hook to hang it all on. Ceterum censeo Unionam Europaeam esse delendam. And therefore the European Union must be destroyed. OK, OK I agree, it doesn't read on T-shirts. But the shorter version does: Unionam Europaeam delenda est. Excellent, but where am I to have these made? Well, actually, I can have my custom sweatshirts made by the good folks at www.Threadsmith.com. Good clothes, made by good people, with a good slogan.....all I need now is people to wear them, right? A new addition to our database of logos, from Jim Roelofs. Use it often and widely, Jim wants it that way. Yes, it’s been said before but it needs to be said again. Madsden Pirie has the details this time. Official! Teabags Spread Foot and Mouth, the EU Says So. Gosh, now, let’s see. Can we in fact guarantee that anything thrown out of our house has not come into contact with contaminated milk? That glass that got chipped? The baby’s bib? The car that you brought the milk home from the supermarket in (where it might have got crushed at the bottom of the boot)? What about you, how can we guarantee that when you pop your clogs you will not have, in your 7 or 8 decades, come across contaminated milk? Does this now mean the rendering of all human corpses? Are we in fact just gearing up for Soylent Green? A report today on yet another bunch scamming the EU out of money. A criminal gang of professionals and academics led by a Sicilian professor defrauded the European Union of millions of pounds in a fake youth training programme, Italian police claimed yesterday after a string of dawn raids across the country. OK, so they've been caught, will probably (given the Italian justice system) get punished, all is rosy, no? According to investigators, the organisation pretended to hold courses for young people in the showbusiness and tourism sectors, mostly in the Sicilian capital, Palermo. What in hell is our tax money doing paying for courses in showbusiness and tourism? Doesn't Italy already have enough fat tenors, lecherous tour guides and indolent waiters? We have a new entrant into our database of graphics expressing our opinion of the European Union. 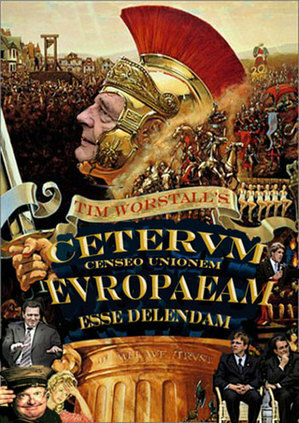 As always you can find all of them in one place, at the post Ceterum censeo Unionem Europaeam esse delendam and please feel free to borrow them as long as you link back to that post and to the originators of the graphic. This is from a think tank in Central Europe, Slovenia I think (my apologies, my command of slavic languages is not all that good). It's pointed out to me in the comments that they are actually from Slovakia. My apologies. In rather more more gifted language than I am capable of Anthroblogogy tells it like it is for the EU. I've said it before, and despite the death of Bernard Levin I have no doubt I shall have to say it again, repeatedly, that there are people out there who can really write, and I am merely a pale imitation. Please do go read, as this man can write. Today is, of course, St Crispin's Day. Three things to do today. 1) Go visit these guys and see why you should support the Campaign for an English Parliament. So much so that in the North Sea, an area that once teemed with fish, cod stocks are now running dangerously low. The International Council for the Exploration of the Sea (Ices) - a group of marine scientists who specialise in the North Atlantic - has released its annual survey of fish stocks. It recommends a minimum cod stock size of 150,000 tonnes in the North Sea. Alarmingly, the current stock is estimated to be less than one-third of that figure, at just 46,000 tonnes. The figures show a similar tale for Irish Sea cod, as well as sharp declines in Bay of Biscay hake and North Sea plaice numbers. Good, we're glad you noticed. They are, however, able only to see the proximate cause, not the ultimate one. They actually think that further European Union involvement is the answer, when it is in fact the EU, through the vile and absurd Common Fisheries Policy which is the problem. A one-year ban would certainly require EU funds to bail out the fishing industry, but the price tag would be relatively small - compared with the cost of the common agricultural policy, a drop in the ocean. Economists have been shouting for decades that the only solution to this Tragedy of the Commons in fisheries is direct ownership of the fish by the fishermen. Only by moving from a hunter-gatherer structure to one of well defined property rights, along with the markets that implies, can there ever be a solution. The four best run fisheries (and the only four with expanding stocks) are New Zealand, Norway, Iceland and the Faroes. All have variations on such property rights. The waters under discussion were, until our entry into the EU, 80% within the UK's Exclusive Economic Area, as defined under the UN treaty, the Law of the Sea. We could, if we were independent, solve this problem ourselves. But we're not independent, we are part of the EU and thus have CFP imposed upon us. The solution? Yes, you guessed it, Ceteram censeo Unionem Europaeam esse delendam.